I used to think that granola was one of those things that you had to buy from a store. I didn’t realize you could make it at home until I saw a post on the blog Chocolate and Zucchini in 2010. It looked so easy and delicious that I decided to give a try. The rest is history. These days I make some serious granola. I highly recommend giving it a try. The great thing is that you can add, subtract, and substitute ingredients as you feel like it. Beware, it’s addictive. 2. Combine oil, syrup, spices, salt, sugar, and honey. 3. 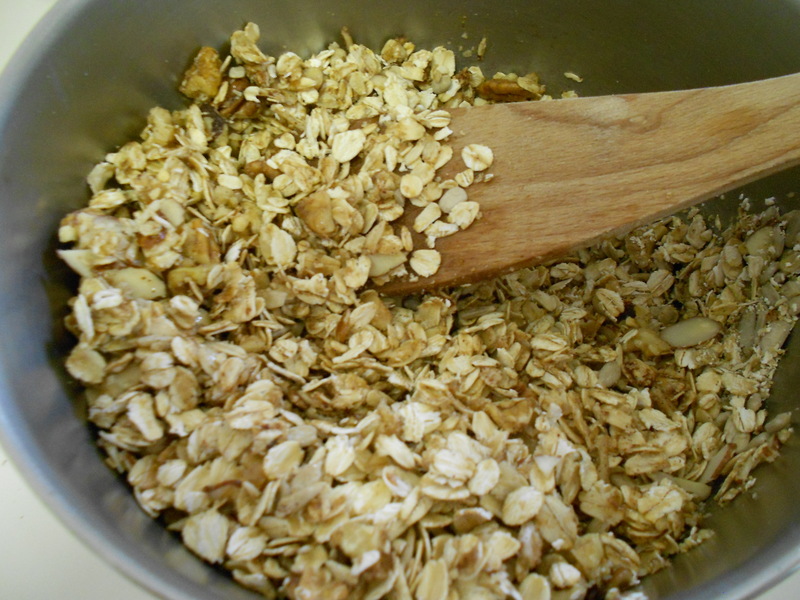 Combine oats, nuts, and seeds. 4. Add wet to dry and mix so everything is evenly distributed. 7. 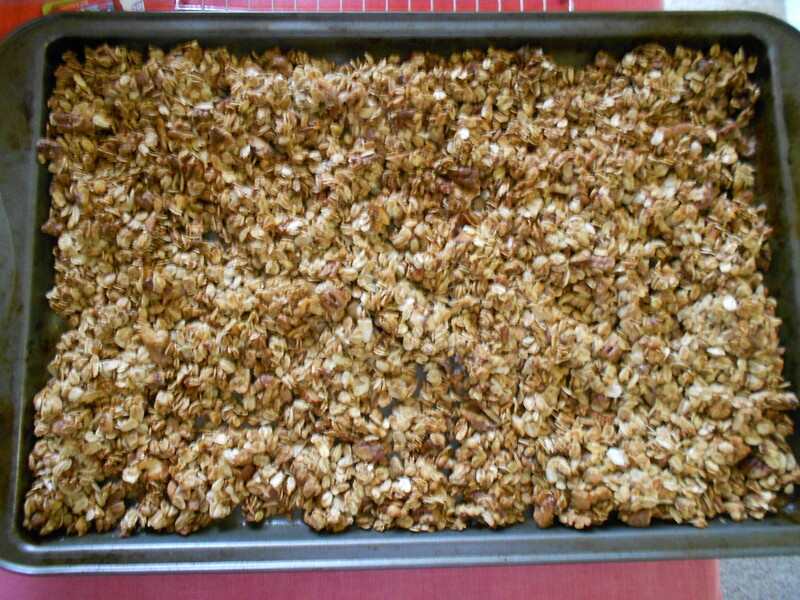 Bake the granola about 40 minutes depending on the oven, or until golden brown. Check on it every 10 minutes or so and mix it up or turn it around in the oven to ensure that it bakes evenly. You should be a little conservative because the granola will continue to crisp up after you take it out of the oven, you don’t want to over do it. 8. 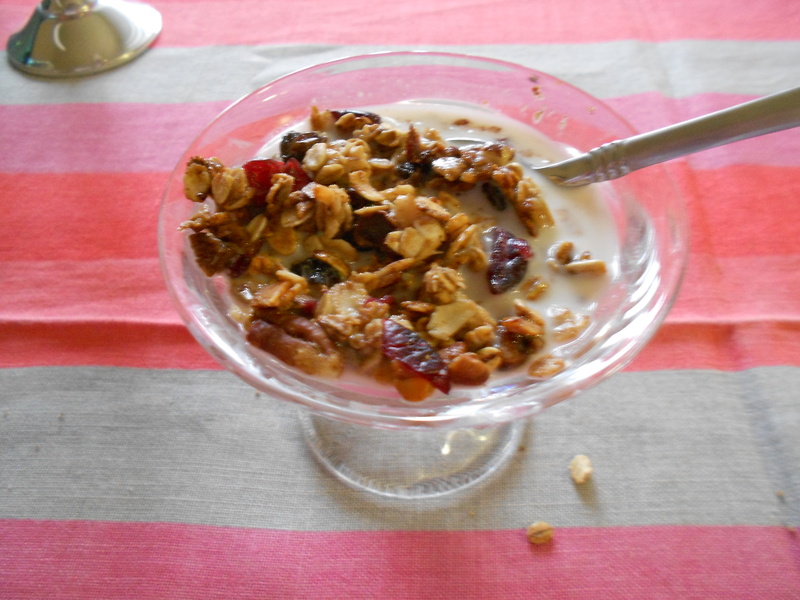 Add the dried fruit when the granola has cooled off. Allow to cool completely before you store it in a sealed container (you don’t want trapped moisture raining on your parade). I like enjoying my granola with a little almond milk. FYI: This is a great food-gift. It’s my go-to hostess gift. I buy a cute container like a mason jar, fill it with some fabulous home made granola and tie it with a pretty ribbon. Voila!